Awesome, beats Go Ape into a cocked hat! 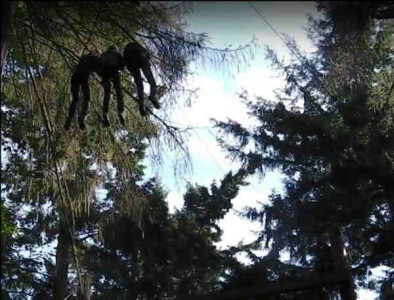 The ExTREEme Adventure high ropes and tall trees course is set at two different heights. There’s the “low” ropes component at 20ft and the high ropes at 40ft. The giant 3G swing can be winched up to a height of 45ft before release. Then there is the option to add the 1000ft long zip line and fan descender jump to the high ropes course. Both of these are from an 80ft platform! We use full body climbing harnesses, and helmets. We do not run lines into the ground: we run them into a stopper block before abseiling each client gently down with the assistance of an instructor. 3G Swing Ready to Let Rip! The 3G swing – an exhilarating ride for any participant who wants to experience the G-force effect. The swing can take 3 people at a time and is winched up to a maximum height of 45ft and one of the participants then releases it into a massive swing. Add these two optional extras for only £10.00 per person – well worth it! 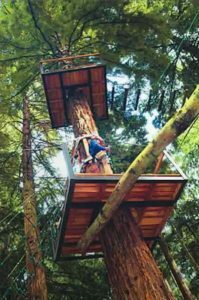 The 1,000ft zip wire and an 80ft fan descender jump – a platform 80ft up a massive Grand Fir, which itself is over 150ft high, gives the braver participants the thrill of flying down a 1,000ft zip wire and dropping on a fan descender in a controlled vertical jump (this is similar, but much higher, than the fan descenders used by the armed forces for parachute training). You will need to add an extra ½ hour to allow time for the extras. If you are unsure, you can always make your mind up whilst doing the course and pay the £10.00 for the two extras at the end. “The Basic” High Ropes Course takes around 2 ½ hours and costs £33.00 for adults and £28.00 for children (over 10 years and under 18 years). For details of restrictions see our safety page. Bookings are made on the hour, 10.00am-3.00pm, to enable us to close around 6pm. We are open seven days a week. Our main season runs from Easter through to the end of October, or longer if weather permitting. 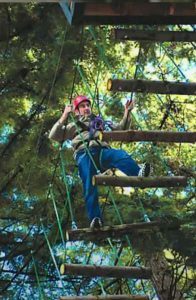 We offer a special discount when combining the high ropes with the assault course. Please telephone 07775 593477 or 01328 838720 to make your booking. The “Fast Tarzan” combines the two 80ft Platform elements: the 1000ft zip wire and fan descender jump together with the 3G giant swing. It is a quick, high adrenaline experience of the most extreme elements of the course. This is ideal for those who are brave enough, or experienced enough, to go straight to 80ft without “acclimatizing” first. The Fast Tarzan costs £23.00 per person for adults and children (over 10 years and under 18 years) and takes approximately ½ an hour. We have free car parking, food and refreshments available at our café, a magnificent covered picnic pavillion, under 10’s play area and woodland walk. See our facilities page for full details.